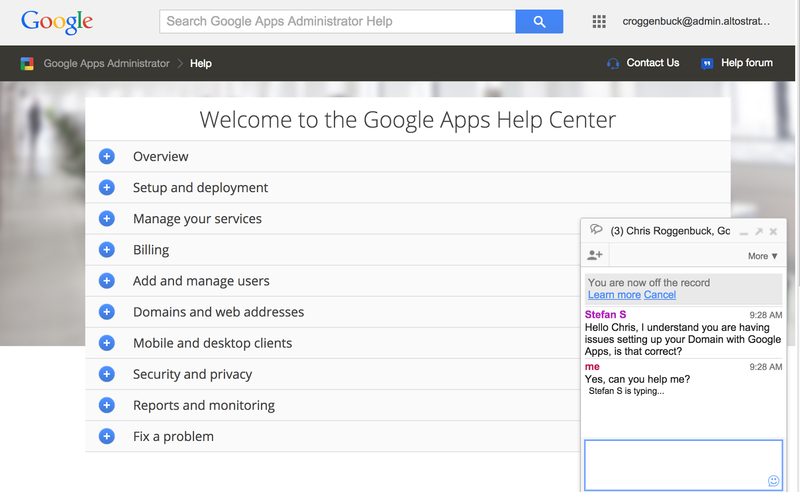 A couple months ago, we started a pilot for chat support with a subset of Google Apps administrators. Based on the tremendous feedback we received (over 90% were satisfied), we’re now rolling out chat support as an option for English-language Apps administrators globally, and we’ll be adding more languages over the coming months. Admins of verified domains can initiate a chat session directly from our Help Center. Finding help should be easy, which is why we put our support documentation and help articles at your fingertips in the product interface. 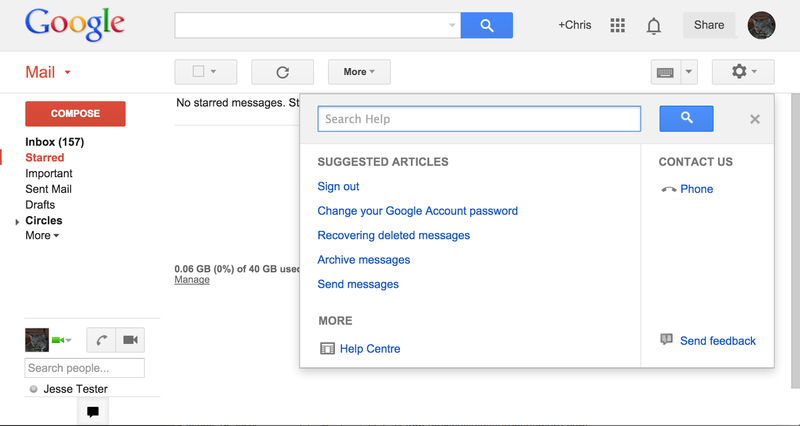 Help is also useful when its contextual — if you’re having trouble in Gmail we want you to have the phone number to call Google without leaving Gmail. To access these resources, sign into one of our Google Apps products, such as Gmail, or the Admin Console then select ‘Help’ from the gear icon drop down in the upper right of your screen. You’ll see a direct link to call Google under ‘Contact Us’ and be able to search our Help Center from the same window. This summer we announced that Google Hangouts is now covered under the same Terms of Service that support our other Google Apps services, like Gmail and Drive. That means we’ve got your back with 24x7 phone support and a guaranteed 99.9% uptime. Over the past few years we’ve been improving our Apps support program to provide a better experience to our customers. We stand behind these improvements and our products, so today we’re happy to announce updated Technical Support Service Guidelines that reflect and guarantee the many improvements we’ve made, including 24/7 phone support for Admins, numerous language options for support, and Google moderated help forums. So how are we doing? Customer satisfaction is one important way we measure success and a few years ago we set a goal to reach 95% customer satisfaction. We’re proud to report that we achieved this milestone for Google Apps. We’ll continue innovating and improving our support program to bring you new ways of getting expert help quickly. If we’ve done our job well, you shouldn’t need to reach us. But rest assured that if you do, we’ll help you get the most from Google Apps for Work. So drop us a line — we’re happy to chat!